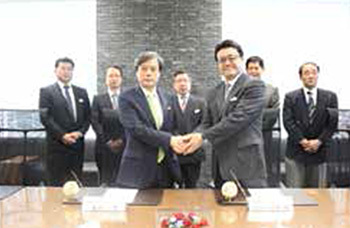 On December 24th, a signing ceremony for our distributorship agreement with Irie Corporation took place. Irie Corporation is a well-established laboratory-related trading company which was founded in 1919 and will soon celebrate their 100th anniversary. We aim to collaborate our respective strengths in fields where we can expect future development such as medical, pharmaceutical and biotechnology by utilizing our production technology and know-how that have been cultivated .